During the intervention were arrested Michael Dacosta, Shawn Ally, Nolan Connelly, Ron Griffith and Owen Drakes, everyone from Guyana. These men are being held without bail at the Metropolitan Detention Center in Guaynabo. If convicted, would be sentenced to between 10 years and life in prison, said the prosecutor. The Director of Administration for Drugs Control Agency DEA, for its acronym in English on the island, Pedro Janer, explained at a press conference that this is the largest amount of marijuana busy so far this year in one intervention . It has a market value of about $ 3.5 million. 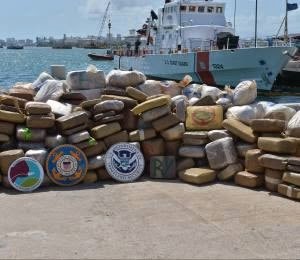 The drugs were seized in a boat 68 feet in length which was seized by federal authorities that make up the Strike Force Runner Caribbean after leaving Jamaica, where it is believed obtained the drug, according to the supervisor of the Narcotics Division of Federal Prosecutor, Jennifer Hernandez.